If what you´re looking for is a unique moment with the most special people in your life, then there is no other experience like the Seine River Cruise with Lunch. Enjoy the beauty of Paris aboard a luxury cruise through the waters of the Seine which will unveil some of the most amazing scenery: the sun shining down on Notre Dame Cathedral, the Conciergerie, a shining Eiffel Tower at night fall, the elegant Alexander III Bridge and much more. We offer several experiences to suit each and every traveller: cruise as you sip on golden Champagne, a special moment to enjoy lunch, a gala dinner, a limousine pick up, ideal surroundings for a romantic marriage proposal, etc. 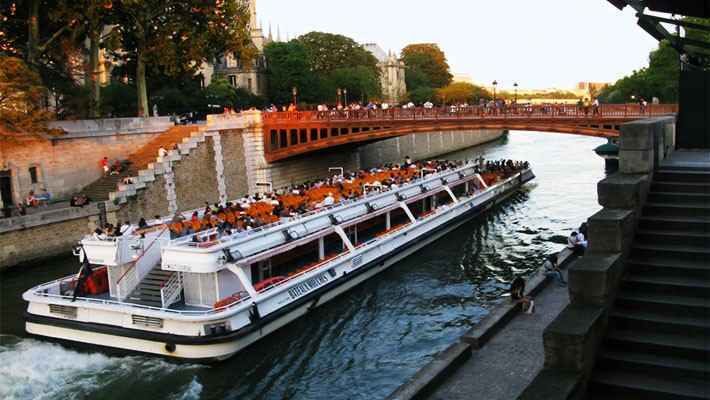 Everything you ever dreamt of can be found on this Seine River Cruise with Lunch. 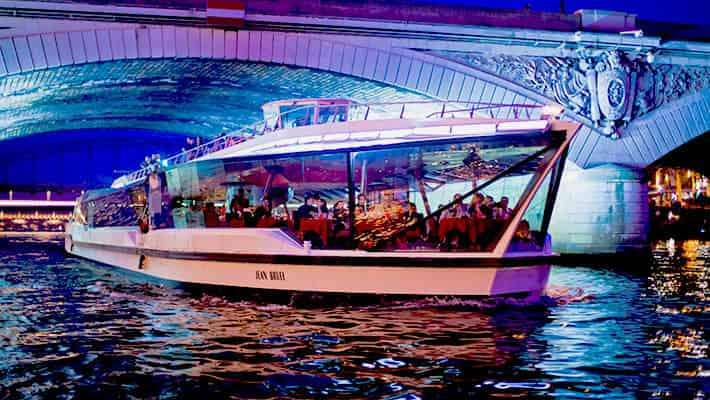 Enjoy two glasses of bubbly champagne as you cruise along the River Seine, this comes as part of the basket “Le Bag” as well as half a bottle of sparkling wine to be enjoyed as you cruise by under the Paris lights. Be ready to toast with a glass in your hand under the morning sun or accompanied by the warm colours of dusk. Enjoy the relaxed atmosphere aboard the cruise ship whilst you enjoy the delights of French cuisine. 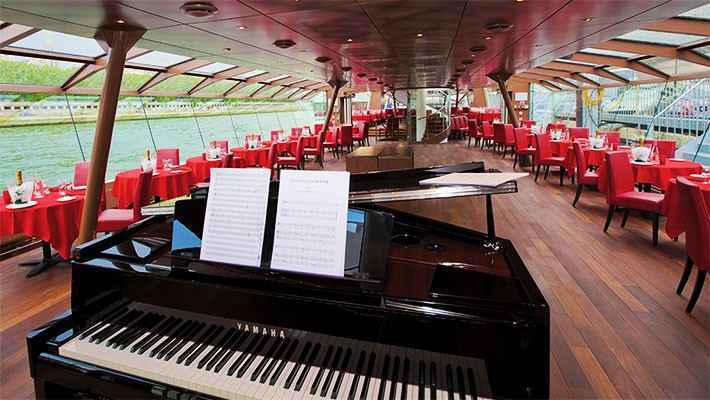 Glide across the waters of the Seine in amazing company, the soft melody of the accordion and a delicious lunch. Sample the option of the Seine River Cruise with lunch available at weekends and on public holidays, choosing your own meal from a variety of several dishes, vegetarian and kids meals are also available. A cruise through the romantic city of Paris under the stars. The splendour of the main monuments and buildings will guide us along the waters of the Parisian river. 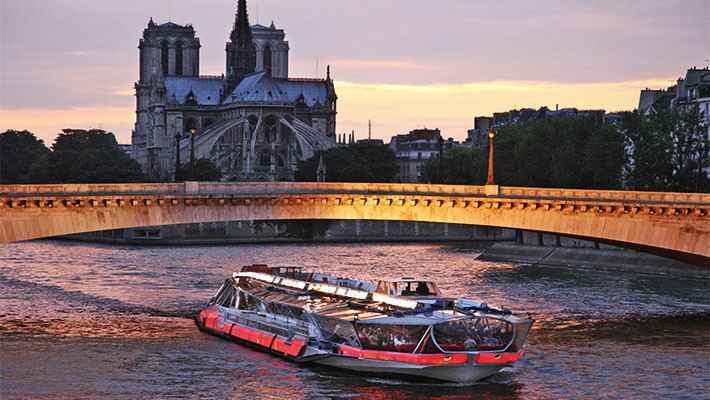 Our Seine River Cruise with dinner is sure to be one of the most enjoyable experiences in the capital city of France. Choose your own meal. Vegetarian and kids meals are available. 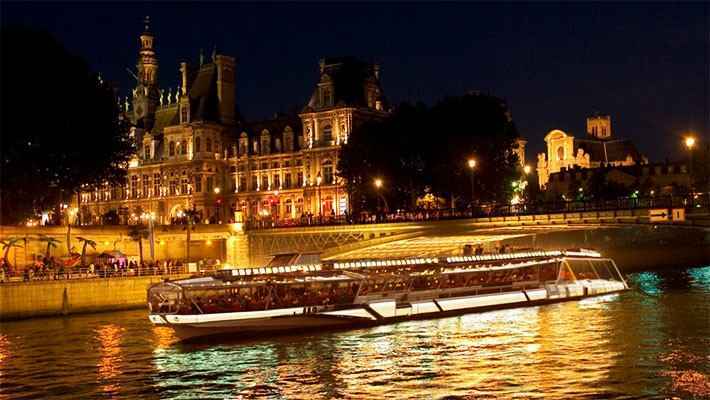 Enjoy the Seine River Cruise with dinner at 18:00h, a perfect evening out as night falls complete with an aperitif, starters, a choice of a main dish, cheese and dessert, coffee or tea and drinks. Be ready to surprise with a Sene River Cruise with dinner Prestige, the ideal gastronomic moment as night falls, complete with an aperitif, starters, a choice of a main dish, tasty regional cheeses, dessert, coffee or tea and drinks. 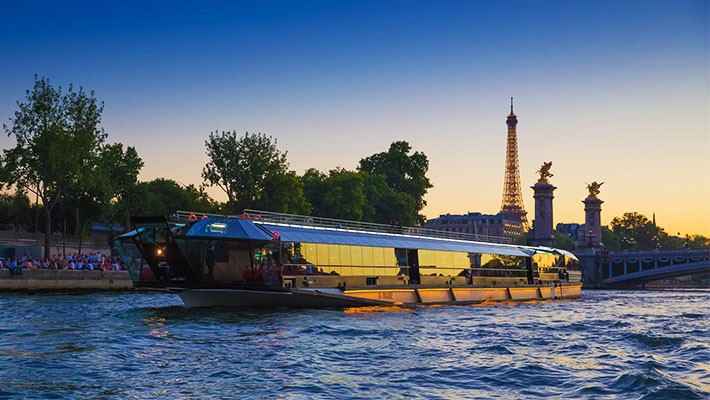 Seine River Cruise with dinner Excellence, a luxury rendez-vous at sunset which includes an apertif, starters, a choice of a main dish, delicious cheeses with designation of origin, homemade desserts, coffee or tea and drinks. 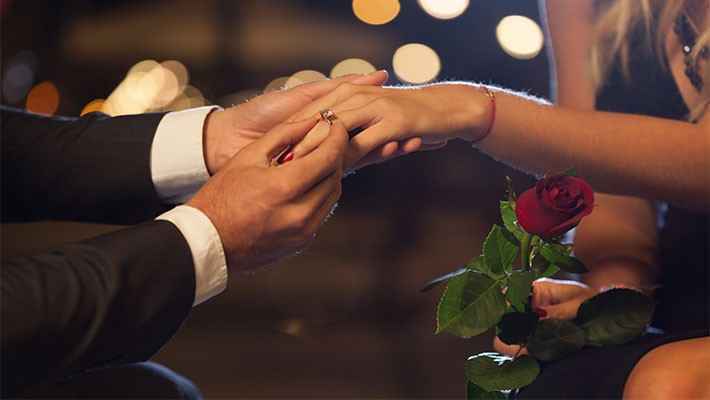 Fall in love with the Seine River Cruise with Marriage Proposal, the moment you have been waiting for to make that wedding proposal. We will pick you up in a luxury limousine and take you to the dock. The cruise ship´s captain will be ready and waiting to welcome you personally and will accompany you to your table, located in the best part of the boat: the bow. You will enjoy a luxury dinner set in a privileged place as you admire the city lights. Our limousine will take you back to the place you have indicated at the end of the cruise. 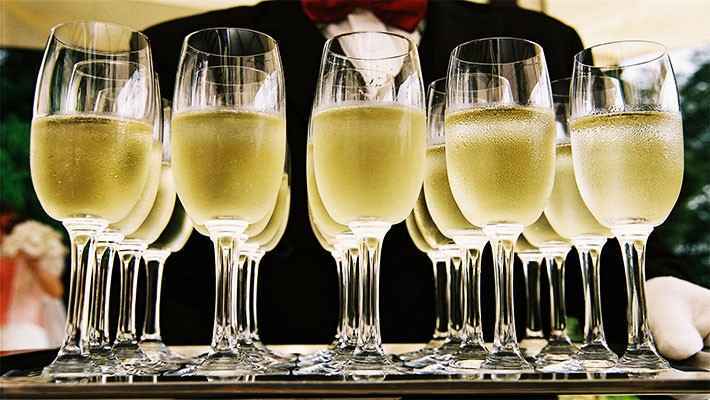 The menu includes a selection of aperitif and a glass of champagne, starters, a choice of a main dish, exquisite regional cheeses of designation of origin, gourmet desserts, coffee or tea and drinks. A feast of French cuisine in a relaxed and romantic ambiance enough to make your heart melt away. Time: (April – September): from 10:00 AM to 10:30 PM, every 30 minutes. (October – March): from 11:00 AM to 9:20 PM, every 40 minutes. During weekends, from 10:15 AM. Price: Adults x2: € 48. Availability: Saturday, Sunday and public holidays. Time: Boarding 11:30 PM | Depart 12:30 PM | Return 2:15 PM. Price: Adults € 69 | Children € 37. Time: Boarding 5:30 PM | Depart 5:50 PM | Return 7:15 PM. Price: Adults € 75 | Children € 40. Duration: 2 hour 15 minutes. Time: Boarding 7:45 PM | Depart 8:30 PM | Return 10:45 PM. Price: Adults € 99 | Children € 68. Price: Adults € 155 | Children € 68. Port de la Conférence, very close to the Alma Bridge. Planning an activity for more than 14 people? In case of groups of more than 14 people, a single menu should be determined in advance. Midday: we kindly ask to wear casual clothing. Night: it is mandatory to wear appropiate clothing. Sport clothing, sandals, shorts, caps, etc. are not allowed. As soon as you finish your purchase, you will receive your E-ticket. Check your email and follow the instructions. Print your E-ticket or take it on your mobile phone to the meeting point. The reference number should be entered in the tickets machine of the company.